ALL TESTIMONIALS BELOW ARE UNSOLICITED FROM GENUINELY HAPPY CLIENTS. thanks once again for this. Can I just say that I don't think I have ever come across a company or business that has been such a pleasure to deal with and who have gone out of their way to deal (more than) satisfactorily with customer queries and requests. Your obvious pride in your product and attention to detail is refreshing these days. If you are ever up for any business or customer service awards and could do with supporting statements, endorsements etc., just let us know. A terrific horse box Clive and Paul - thank you. My 6 hour drive back home from picking up in Flint yesterday was effortless; a very comfortable vehicle to spend time in. Our 16h horse loaded pretty much first time today too and the gaggle of admiring people from the yard is proof indeed of how unusual and attractive it is. We've got our first show show in it next weekend and very much looking forward to many thereafter. Thank you again - great service and a super box. Sorry not to have been in touch but have been very busy competing and trying to find a new dressage horse. I just wanted to drop you a line to say how thrilled we are with the new box. The whole design not only looks fabulous but just works brilliantly and is obviously designed by people who understand the needs of both horse, rider and competitor. The box is is a bit like the tardis and people are amazed how much room and storage there is in it and how everything has been thought of.The build quality is excellent and it drives so easily giving the horses a really comfortable ride. Since buying the box my wife has qualified for the regionals at elementary; my daughter came second in her first dressage test, has had some great show jumping results and has started to play polo-and the box has been a real topic of conversation wherever we go. I have lost count of the number of people who have come up to us saying that they have real “horsebox envy” and asked to look at the box. I would highly recommend Boss Horseboxes to anyone as it is a fantastic box with a great production team and fantastic follow up and customer service. It has been a real joy to deal with you as a company and as individuals so many thanks. I would just like to say how utterly delighted I am with my new horsebox. Thank you both very much for all your efforts. I really appreciate it. Northampton to Sussex return and then from Northampton to Cheshire and back. to spend talking to people who are admiring it!! Just to let you know, I am really pleased with my new Boss. It is a pleasure to drive and both horses have travelled really well in it. June 2013"Re our new Boss 35, I am writing to say I’m thrilled to bits with it. Its so convenient to drive with no stress for me or my horses. I love the layout, everything seems just in the right place. It looks great too." "We are thrilled with the lorry. It does everything we need it to - carries all 5 of us, plus two ponies, plus all our endless clobber. It's so easy to drive - even I can manage to reverse it backwards from our narrow lane onto the drive, and it's so easy to pop out it in I have (sheepishly) found myself using it to move the ponies (plus clobber!) 1/2 mile down the road... And you guys have been unbelievably fabulous getting it built to a very short deadline. So a really heartfelt thank you - it was definitely the right choice, and you've really been a complete pleasure to deal with". "I chose a BOSS because I was impressed by the intelligent use of space but what made this horsebox extra special was the company's willing enthusiasm to find practical solutions for additional features. Their co-operative attitude resulted in a vehicle that did not cost a bundle but made me feel like a million dollars. However, of far more significance is the effect of the easy ramp and the light and airy interior on my 16hh, overcautious and occasionally stubborn horse. The first time I loaded him I was unassisted and was delighted when within five minutes and without coercion he calmly walked in. That is how a horsebox should be". Just to let you know we are thrilled with our new horsebox and the attention to detail that has gone into its design. The horses travel really well in it and stay nice and cool. My customers love arriving at their shows in such a posh box! I still can not believe my 'pin-up' is parked on our drive! Many thanks for your help in making that happen". payload it gives allows me to take both my horses and their equipment without the worry of being over the weight limit. Your weekly updates were great and gave me confidence in the build process. Thanks to you and the team, Helena." Great to see so many slightly different Supalite options coming through from you - I hope that business is booming! I am now totally used to my Supalite and it's absolutely brilliant; much admired I think on the Western show circuit and everything always seems to be in just the right place when you need it, which is what it's all about! 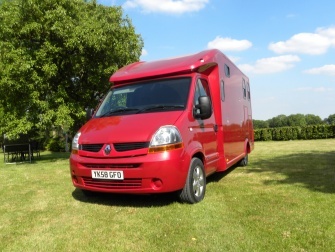 Just back from staying in it for 5 nights where I travelled 2 horses down to Kent, it drove beautifully with 2 on board, even with my little mare kicking away from time to time, and it worked really well as my accommodation too. Wishing you all every success, looking forward to seeing more Supalites out on the road. "I LOVE my new lorry. A joy to drive, and so quiet I can enjoy Classic FM. And a 3 hour plus journey used up less than £30 diesel, which is bliss compared to my 7.5 dinosaur. Horse loved it too - after a mile or two of re-adjusting to facing backwards. "I would like say how pleased I am with my Boss Supa-lite box. It is a pleasure to own and drive. Everyone at Boss has been so helpful from day one and continue to be after sale. You found my perfect colour and made the process of designing it easy. My horse travels really well in it after not enjoying being in a trailer. ?I simply love it! Well done and I hope you continue to do well with this fantastic horsebox. I would highly recommend Boss to anyone!" "Dear Clive, Paul and all the team at Boss Horseboxes . . . .
Just a few lines to say thank you so much for my new Boss Box – I am absolutely thrilled to bits with it, and it exceeded all my expectations! As you can imagine I have been out in it every week, and have found it a pleasure to drive – I certainly don’t miss my 7.5t box. My horse travels the best I think he has in any box. The down side to this is that half the time spent at shows is showing people around it . . . last weekend I had no groom as my mum was still chatting to people who thought it was the nicest 3.5t they had seen – so you come highly recommended to the nice people of Derbyshire, Shropshire and Cheshire!! Once again many thanks for your friendly and understanding manner – I really hope business continues to do well for you. I would just like to thank everyone at Boss for their professional yet friendly service and all their assistance in the purchase of what we and our clients believe is the most unique well finished and eye catching 3.5tonne box available, we will certainly recommend your company to all friends and clients looking to purchase. I wish you all the success in becoming NO.1!! and look forward to seeing you for another addition to our fleet soon..
As a regular hirer of self drive horseboxes, I just wanted to say how impressed I was this weekend with the design of one of your boxes that we hired. Each time we hire, there is usually something about the design of the box that makes it difficult or things just seem to be in the wrong place, especially with a lot of them where the horses haynets hang and the tack/seating area then gets covered in hay! I particularly liked the outside tack locker on your horsebox. Plus the overall quality finish.